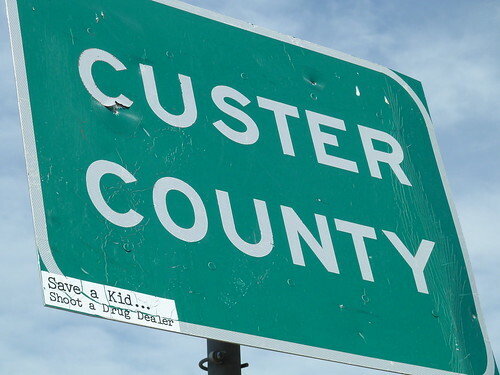 We headed out of Pueblo early to avoid the rush hour and the heat, the route taking us quickly up into the foot hills of the Rockies and into Custer County, where the sticker on the County sign stated “Save a Kid, Shoot a Drug Dealer”. The scenery started looking more like a set for a western movie with rock stacks rising out of the plains, sage brush covering the ground and a landscape that seemed to support only cattle and antelope. It had been so long since we had last seen hills that they had a novel attraction, although I didn’t expect that to last long. A message had come back down the trail from Keith who was a day ahead cycling with his brother. He advised us to cycle the Arkansas River Walk (are ken saw, not are Kansas!) 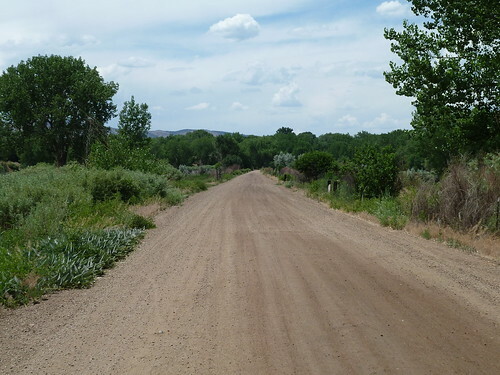 to take us to Canon City and avoid the busy main road. This we did and it was a gem of a cycle path with very few people on it and the tumbling Arkansas river beside us. The area we were cycling through seemed to be a popular spot for Correctional Facilities (prisons!). A vast one covered acres across the plains outside Florence and allegedly holds some of Americas worst criminals, I gave them all a wave as I cycled by knowing that the freedom I was feeling on the open road was in complete contrast to the razor wired entrapment of that high security hell hole! 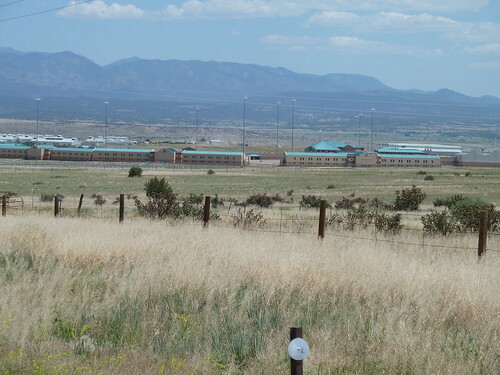 Even Canon City 9 miles up the road had a large prison, bizarrely right on the edge of town. The inmates must be able to smell pizza cooking and hear the chink of glasses from restaurants across the street, I think I’d rather be out on the plains! Leaving Canon City we climbed for 10 miles on the fast highway 50 and with the shoulder strewn with glass and wire from blown radials it wasn’t long before I started to loose air from my front tyre. I nursed it up the hill pumping it up every mile, this wasn’t made easy by the storm that came in and soaked us through to the skin. 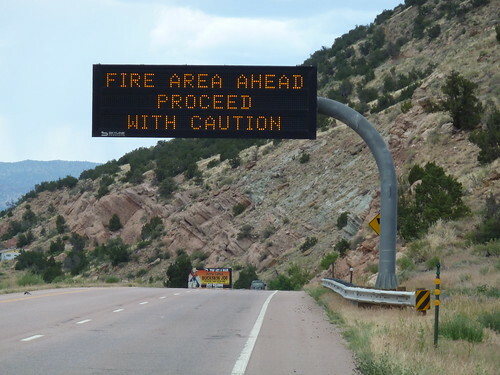 We also had forest fire warnings flashing at us from the overhead gantries; certainly not the most memorable 10 miles! Arriving at the “Mountain Vista RV Park & Cafe” at the top of the hill was a welcome relief and the Hispanic honey of a waitress was a little darling and topped up our coffees endlessly until we thawed out. 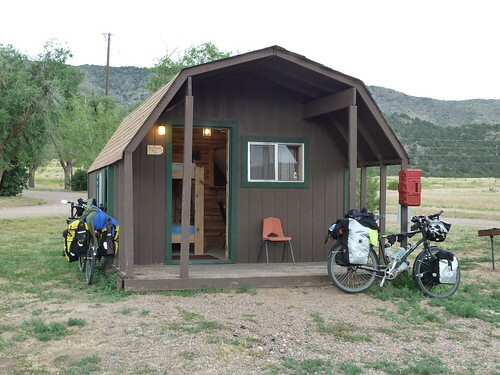 The RV Park also had Cabins at a reasonable price, so that was that, WiFi, good grub, eye candy and cabins, we were sold! 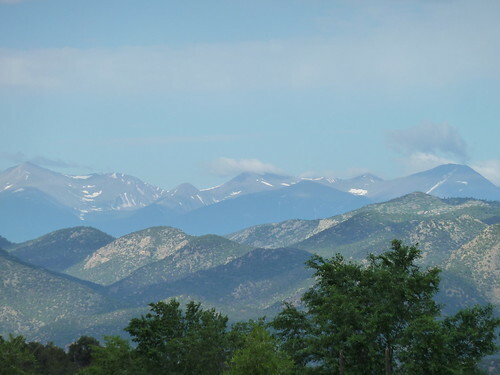 The name of the RV Park was quite apt, the views from our glorified garden sheds was of the snow capped high peaks and with the cold thin air we really felt we had made it into the Rockies.